Organizations require feedback — from customers, employees, and other stakeholders — to survive and prosper. Surveys can capture feedback, but survey programs don’t always deliver to their promise. Our Survey Design Workshop can help deliver the promise. So management questioned the value of the program. And it just withered away. Or perhaps you’re now in charge of running a survey program with no background in survey research design. You recognize that successful survey design is more than just asking a bunch of questions. Then the Survey Design Workshop will help you get full value from your survey program. 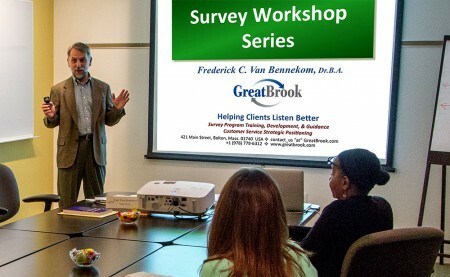 Our survey training will teach you how to design or improve your survey program with a special focus on designing valid survey questions. SurveyMonkey, QuestionPro, and all the other online survey tools make it easy and inexpensive to create surveys. They help you launch surveys fast and easy. But they don’t train you on the critical survey design skills needed to generate actionable, useful, and valid data. And after all, isn’t that why you’re doing the survey — to gain insights that can use? Dr. Fred’s course, taken in 2012, was absolutely great. My surveys ended up well so written, I navigated the OMB (Office of Management & Budget) approval process in near record time, impressing leadership at the National Weather Service. NWS now has 18 surveys which can be freely used by the local offices to conduct post-storm event surveys on anything ranging from tornadoes to hurricanes, droughts to flash floods. The courses are fun, interactive, and very informative. 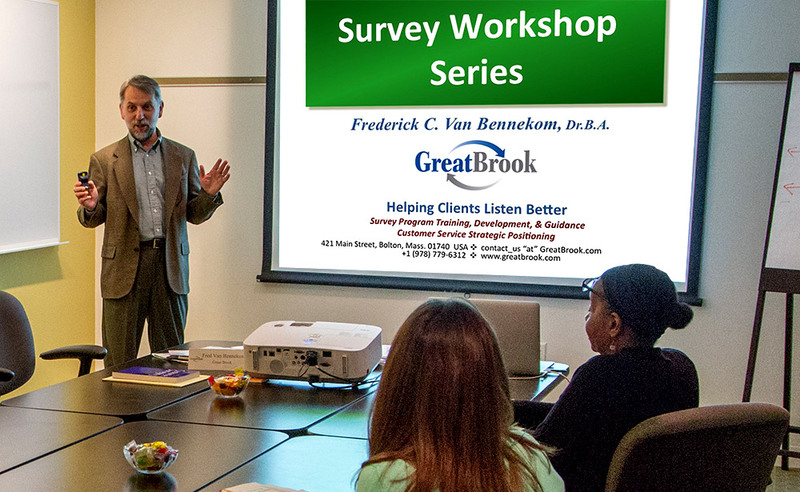 My team took the Survey Workshop Series by Dr. Van Bennekom. We could not have asked for a better teacher. He teaches in a way that is both enjoyable and easy to understand. We were able to instantly look at our existing surveys and make immediate improvements. On the back-end, we now have a better understanding how to take the survey data generated and put them into use. This workshop not only met, but exceeded all of my expectations. The information that I gained will support us in better questionnaire design and implementation. Dr. Fred’s candid teaching style really made a difference in. He was always open to questions and his organized methods kept us all on task to gain the most from the workshop as possible. The next phase of a survey project, Survey Data Analysis, is covered in our companion workshop. Plus you will get feedback from a survey expert — and the class — on one of your own surveys. 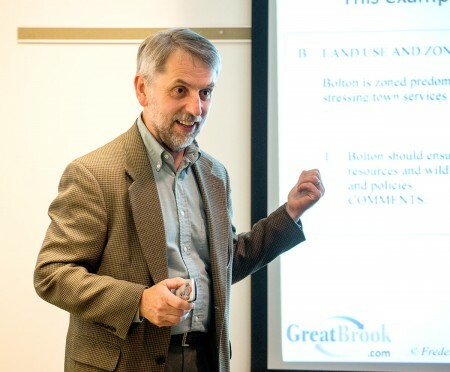 This survey training class is appropriate for most any type of survey project — customer satisfaction survey, employee survey, member survey or market research survey. We have trained surveyors in all survey application areas. Detailed survey training curriculum and the workshops’ Learning objectives. Are you a US Government employee? Don’t have time for a two-day survey class? Then come for just the first day, which we call our Questionnaire Design Workshop. We’ve designed the curriculum so that the basic, essential material is covered in that day. While we feel that the second day’s material — including the survey reviews — is extremely valuable, we know that time is short for all of us. You can always take the other days at a later time, priced as if you took them all in one trip. How do our attendees rate the course?